When thinking of powerful personal experiences, we often think about the specific locations that have shaped our memories. Over time, memory has been proven as a tool to place our experiences and when we revisit certain locations, emotions are triggered, transporting us back in time. Mapping Manhattan is a location-based app, allowing users to discover memories from various New Yorkers. The app notifies users when they are in the geographic location of a recorded memory, and allows them to move through that memory. The app is a collection of archival photographs that leads to the written and aural recording of an experience. As the user moves through the images and quote, the larger picture from the past is revealed. The final piece of the experience is an external article that expands on the quote, providing more insight into each memory. As the user moves through the images and text, the larger picture from the past is revealed. The experience begins with photos and a quote, and ends with a link to a text and audio recording so that the user can further understand what the person experienced while in the location they were recalling. The final piece of the experience is an external article that expands on the quote, creating a fuller picture of each memory. Audio is a powerful storytelling tool for the app, allowing the user to more fully immerse into the memory they have viewed of the location they are currently in. For my preliminary thesis exploration and research, I designed a pamphlet investigating different ideas tied to memory. I knew I wanted to focus on memory, but I was not sure which areas were most interesting to me, so this helped me discover different types and connect themes. 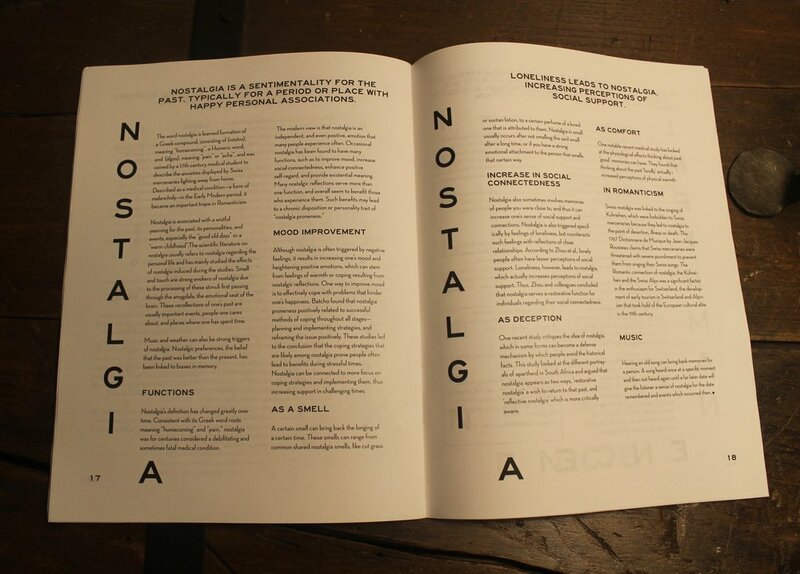 Each spread’s text is from Wikipedia articles on each concept. Some examples include spatial memory, impermanence, amnesia, nostalgia, and repressed memories. I have learned from the thesis process how integral and exciting research can be for design projects. Creating this pamphlet illuminated my specific interests, as well as narrowing down what I would be focusing on going forward with my actual thesis project. In my final project, I worked with the ideas of nostalgia, impermanence, and how memory is linked to place.